ThatGalJenna: A Look Back - Ireland - photo heavy!! A Look Back - Ireland - photo heavy!! I thought it would be fun to share a bit of my trip across the pond, it seems like I was there light years ago, but it's only been 3 years! When my grandfather passed away, he wanted to make sure I got the chance to visit our "homeland" in Ireland, so with the money he left me I booked a ticket to Ireland and never looked back! Plus I was lucky enough at the time to have a girlfriend who had recently moved to Ireland after marrying her husband who is a native of the country. I could hardly say I've been to more than a handful of states outside of where I live now, so my Ireland quest was a experience to say the least, one that I was fearful to conquer all by myself but I did! Don't get me wrong though I ran into some bumps on the way, like being seconds away from missing my return flight, but all things considered it was amazing! Okay, enough words, time for photos! One of the first things I saw while traveling through a small town - not a sign you see very often. They have quite the view! I chose to go without a coat in the month of October in Ireland...I am a cold weather girl...so the weather was perfection! I didn't want to leave...this place...and Ireland in general. It was breathtaking. Ahhh this photo is3 years old! I feel like I look so different...I love how the sun is hitting my hair. This was taken after the walk from where I was when I took the photo of the cemetery...quite the walk! 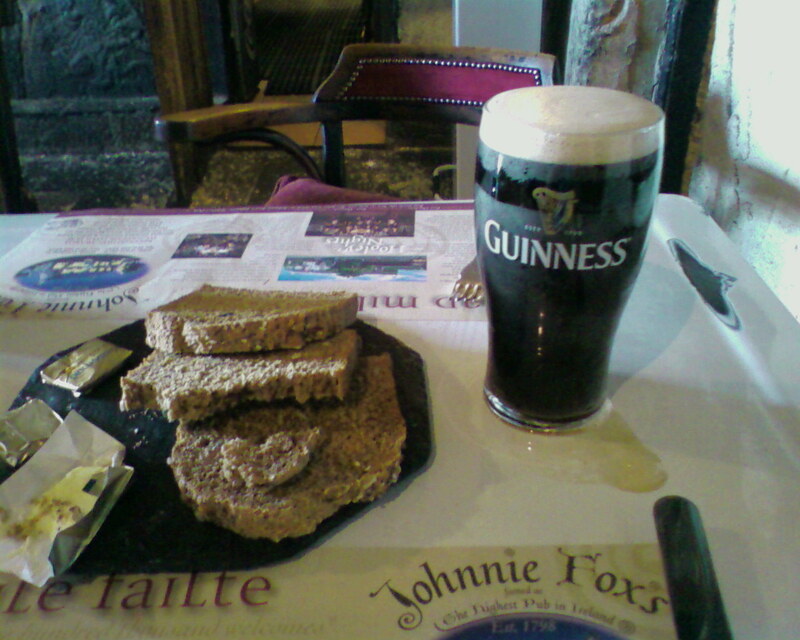 Ahhh an Irish pub...dark wood...dark beer...and heavy food! This cracked me up...they made Ireland look like a little person driving a car! I wasn't able to take tons of photos inside...this was so hard to capture in all it's glory...each little piece of this are individual specs of tile. The color was so vibrant! My last glimpse of Ireland before heading back to the states! I hope you enjoyed the mini-quest through Ireland! Ah, love all the beautiful photos! You look gorgeous! alright I am ready to go :) Guinness +vanilla ice cream =perfection. Oh my goodness! These photos are SO LOVELY! I am going to Ireland next summer for my honeymoon, and I am thrilled because I have always wanted to go there! Thanks for making me even more excited, hehe :) I'm glad you had a great time! Beautiful. I'd love to go there someday. What beautiful pictures. I wish I had a job where I could get lots of time off to travel. But I do love looking at everyone else's travel pictures. So beautiful. I am from England and I hate to admit I've never been to Ireland but I'm sure I would like it. Especially the pubs. Seeing these photos do remind me of my home though and there's not really anywhere here in SoCal that compares! Great pictures! I just went to London and Edinburgh in March and it's so beautiful over there! Thanks for posting the beautiful pictures for us to enjoy!